Firstly thank you and all the gang for a fantastic fun and well organised shoot over the weekend. The club is affiliated to GNAS, Cheshire Archery Association and Northern Counties Archery Society as well as ILAA and BLBS. We run a rolling monthly beginners course which reduces the waiting time people may have experienced from other clubs. We have a 20 yard, 3 lane indoor venue at The Archery Centre in Birkenhead and an outdoor venue that allows members to shoot up to 80 yards target archery and all distances in clout archery. The club has members that are experienced in all those areas. With four Archery GB qualified coaches we can help all archers develop and progress. Our members consist of both male and female archers with seniors and juniors competing in Archery GB indoor and outdoor tournaments. Some of our senior archers represent the club in the winter Cheshire leagues. The Longbow Club has four Archery GB qualified coaches. 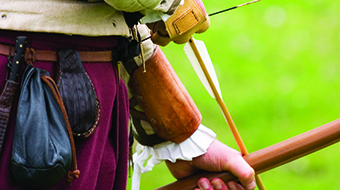 In addition to Archery GB membership some of our members are also associated with National Field Archery Society (NFAS), English War Bow Society (EWBS), British Long Bow Society (BLBS) and are actively encouraged to shoot all forms of traditional archery. If you want to join an archery club or shoot competitively then this archery beginners course is for you. All the equipment is provided by us – all you have to bring is yourselves and a smile! Our course run by official Archery GB (the sports governing body in the UK) fully qualified archery coaches. 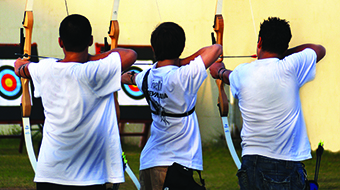 We will teach you basic shooting techniques, archer and range safety, range layout, etiquette of the sport, scoring and also general equipment knowledge. A beginners course is for people to take the next step from an archery have-a-go session.